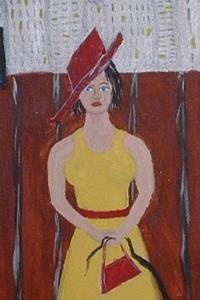 This painting is loosely inspired by a woman I saw yesterday standing at a bus stop. 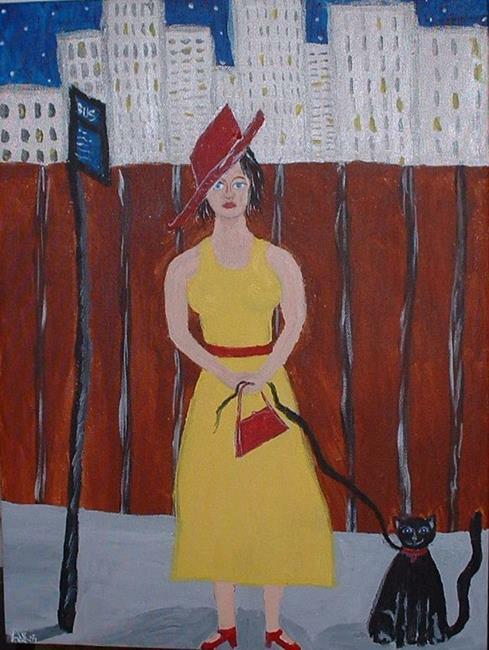 Obviously I added the cat on the leash and the outlandish hat, but something about the woman caught my attention. In that 5 seconds or so that I saw her (driving by in my car) the whole inspiration for this painting came in flash right then. It's odd in nature, but that is exactly as I wanted it. Colors represented here are yellow, red, blue, brown and silver. . I will be finishing this painting with a non-yellowing, glossy coat of varnish before shipping for added clarity of colors. This is an ORIGINAL, one of a kind painting, created by me, Kathleen A. Roberson, and I have signed it on the lower left-hand corner. 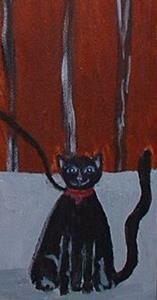 As with any of my auctions, if you have any questions, please do not hesitate to contact me. In whatever piece of art you choose to buy, thank you for stopping by and viewing my art, and for supporting self-representing artists.